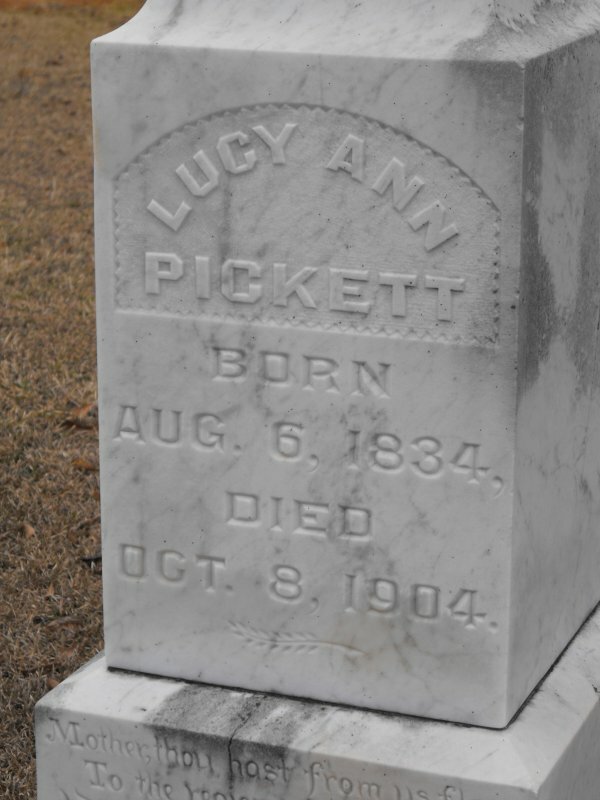 On This Day in 1904 Lucy Ann Rackley Pickett died at the age of 70. Lucy was my 3rd great grandmother on my dad’s side. She was born in Choctaw, Alabama 6 Aug 1834 to Anthony Rackley and Julia Johnson. She was the baby of six children, with three sisters and two brothers. She gave birth to a daughter in 1859 and another in 1860, but the records I have say she didn’t marry until 1860. It wasn’t unusual for the time to only have a ceremony when a traveling minister came through town, or it could have been that the wedding certificate wasn’t filed until 1860. 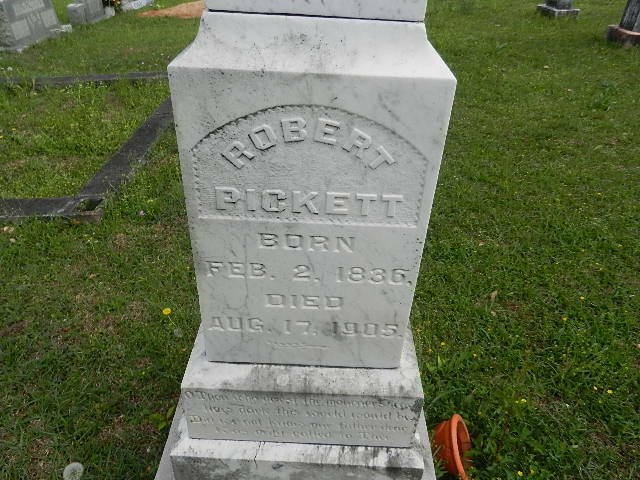 Either way, she married Robert Theodore Pickett and the two had four girls followed by five boys in Alabama, one being my 2nd great grandfather Joseph Lawson Pickett. Sometime after the 1880 census, the family moved to Mississippi. Lucy’s mother had died in 1860 and her father lived with her until his death in 1880. That may have been the tipping point of leaving Alabama. The family was in MS by 1891 when the youngest daughter married there. Lucy died in Mississippi 8 Oct 1904 at the age of 70. 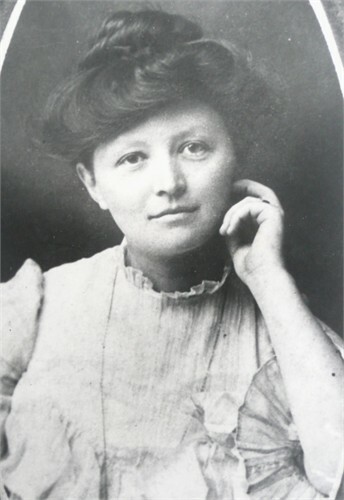 Her husband died a year later 17 Aug 1905. They are laid to rest at Pleasant Hill United Methodist Cemetery in Zero, Lauderdale County, MS.
For those of you don’t do genealogy, you have 2 parents, 4 grandparents, 8 great grandparents, 16 2nd great-grandparents, and 32 3rd great-grandparents. The family tree grows exponentially. This generation of 32 people in my past have been on my mind a lot lately due to the feeding frenzy of liberals trying to erase the history of the Confederacy. Personally, I don’t have a problem with the Confederate flag, but I understand that hate groups have adopted it and it may no longer represent the South throughout the rest of the United States. Perhaps it is time for a discussion about where it should and should not be flown. I do, however, have a problem with the hatred that these history-erasing people, including some of my very own friends, are spewing and the way vandals are destroying flags, graves, statues, and monuments. You’ll see why in a moment. I’ve decided to not write about only one of my 32 grandmas and grandpas, but all of them. Of the six missing names; two were in Dublin, Ireland, their son (my 2nd great) arrived on the shores of Florida in 1861; two were Choctaw Indians in the Choctaw Territory of Mississippi but I don’t know their names; and the final two are unaccounted for as I have not been able to trace them, but their daughter (my 2nd great), was born in Alabama in 1848, so they certainly lived in the South. Notice anything?? Yes, 26 (28 if you count the Choctaws, 30 if you count the folks living in Alabama) of my 32 3rd great-grandparents were born in the Confederate States, and EVERY ONE of my 16 2nd greats lived there also. From the records I have: six of the men above fought with the Confederacy (noted by *) – two died in battle (noted by **). 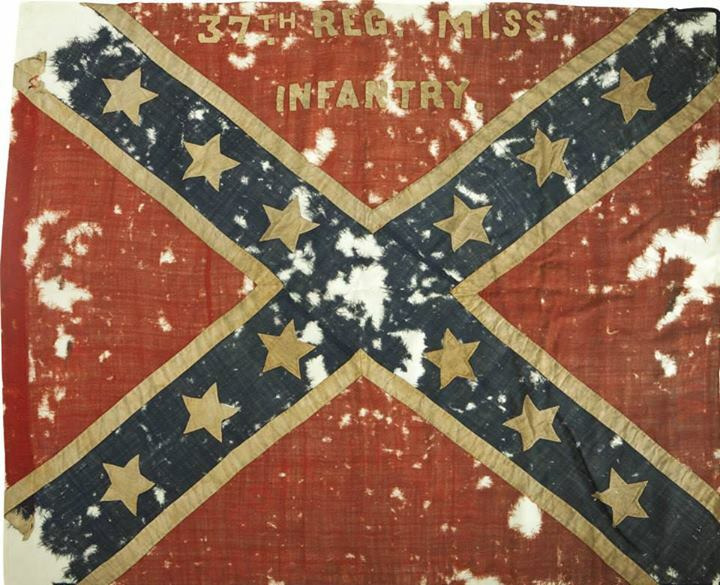 Three of my 2nd greats (sons of the above) fought with the Confederacy, not to mention the countless brothers and other sons who served and sometimes died. Mary Ann Rodgers named above lost three brothers, three brothers-in-law, and her husband. Off the top of my head, eight to ten of these families were in America during the Revolution, fighting for freedom – the freedom to say and do as you please. You have the freedom to be “offended” by the Confederate flag. It was given to you by MY ancestors who have been struggling since the 1600s to build a great country, even before it was a country. Here’s where I have a problem. You don’t have the freedom nor the “right” to desecrate Confederate graves, statues, monuments, Confederate cemeteries, or the flags within their boundaries, and you certainly don’t have the freedom to take away my heritage. You will never accomplish that. You will never change how I feel about the men who fought in the Confederate Army. They are AMERICAN soldiers. They will always have my deepest respect for being willing to die for what they believed in, whether you agree with their cause or not. My heritage will not be erased. It will not disappear. Do you want to know why? Because I will fight to keep it alive in my family, my community, my descendants, and my heart. I will fight with the same veracity shown by my grandparents when they fought for their freedom. After all, their blood runs in my veins, too. 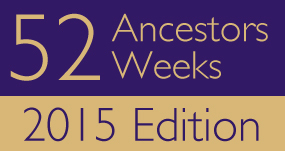 The last Ancestry post was about mom’s side, so in fairness, here’s one about dad’s side. 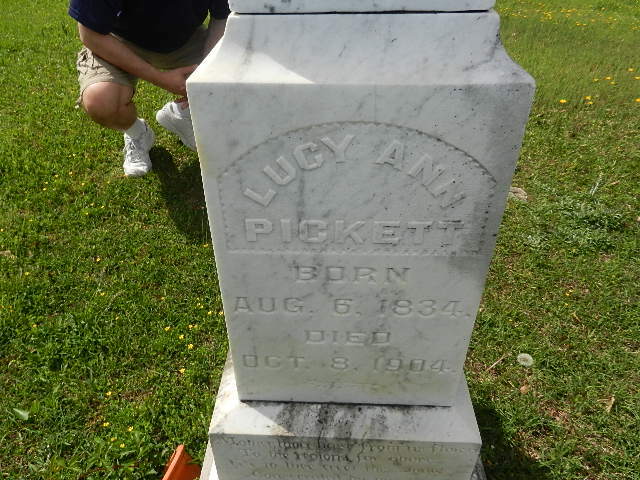 My paternal great grandparents, whom I knew and loved dearly, were Ben and Eula Pickett. This entry is about Ben’s grandparents. Robert Theodore married Lucy Ann Rackley in Choctaw, Alabama in 1860 and shows up in the census there through 1880. All of their children were born in Alabama, but at some point, the entire family moved to Mississippi. If you don’t know, the 1890 census was burned up in a fire, so it is not available to us to research and hunt for clues. I know the family was in Mississippi by 1891, when the youngest daughter was married there. 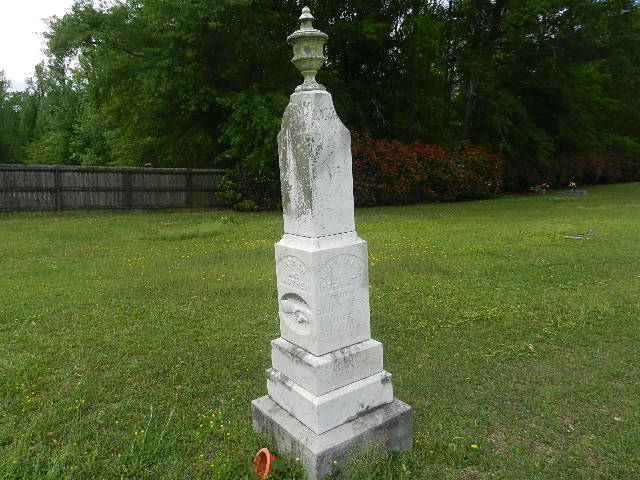 All except the youngest son are buried at Pleasant Hill Cemetery, Zero, Lauderdale County, MS. 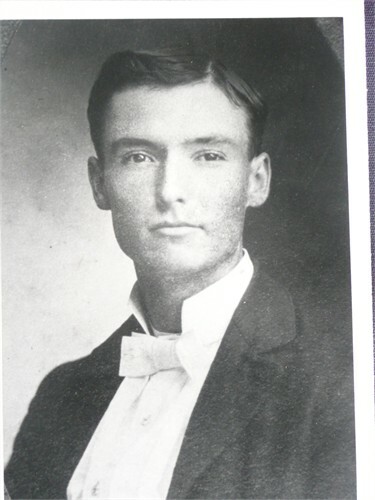 The youngest son died in Sicily Island, Louisiana and I do not know where he was buried, but he is not at Pleasant Hill. I have photos of all of their headstones and most of their death certificates, but I won’t bore you with them. The only photographs I have of any of the children are the youngest son, Rev. Robert Tilden Pickett 1876-1947 and his wife Lilian Price 1877-1962. They married in June of 1904, three months before his mother’s death. Two things strike me about the above dates: 1. Joseph and Lloyd couldn’t possible be born in the same year. One was born in Jan and one in Feb, so someone put the wrong birth year on the headstone. I have neither of their death certificates. 2. Maggie and Betty both died in 1924. According to their death certificates, which I have, Maggie died on June 26th of cancer and Betty died on August 28th. That must have been a difficult year for the siblings. Also, only one of the four girls married – Annie Mariah. She married James Henry Fisher Sr. James’s sister, Caledonia D Fisher, married Joseph Lawson Pickett – the above mentioned 2nd great grandpa. “Callie” and “Joe” were the parents of my great grandfather, Ben Pickett, mentioned at the beginning. So, a Fisher brother and sister married a Pickett brother and sister. I know who my 2nd great and 3rd greats are, but I still have to stop and think about that for a minute. Annie Pickett Fisher and Callie Fisher Pickett make me stop and scratch my head every time. 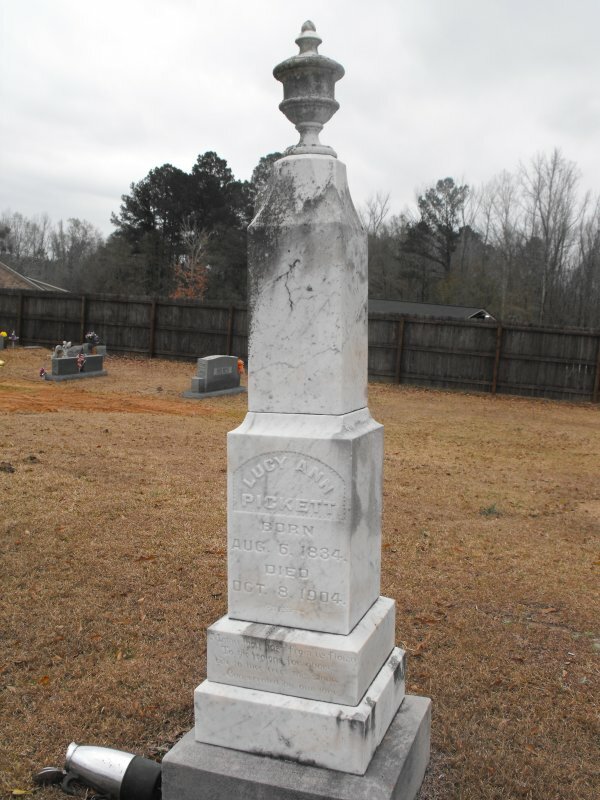 Lucy Ann Rackley (3rd great grandmother) was born in Alabama on 6 Aug 1834 and died in MS on 8 Oct 1904. Her father was Anthony Rackley and her mother was Julia A Johnson, and she was the youngest of their 6 children. Her parents were born in North Carolina and Virginia respectively, and both died in Alabama, though I am not sure when or why they moved there. Her mother died in 1860 and her father died just after 1880. Perhaps that is when the family decided to move to Mississippi. Fortunately for her, none of her children died before her, and her husband outlived her by 10 months.